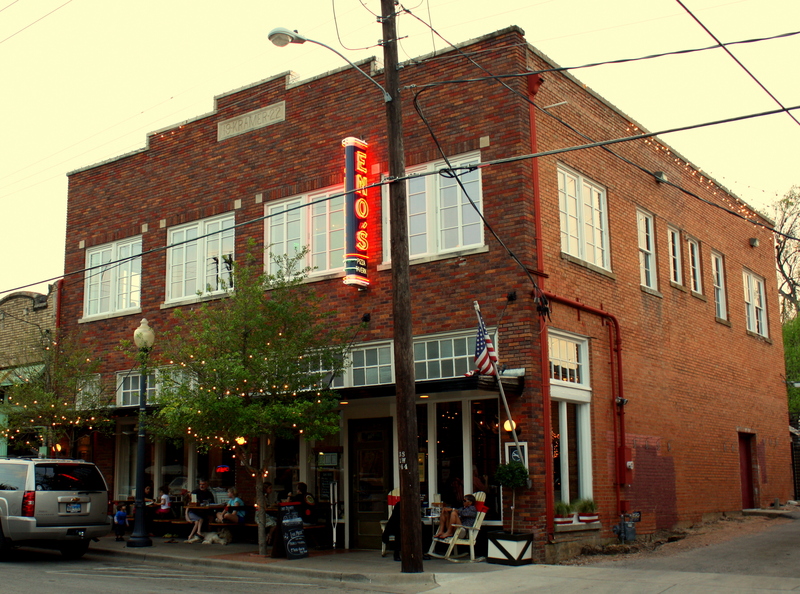 The Bishop Arts District is one of a handful of old Dallas neighborhoods that in their rebirth have embraced their past. 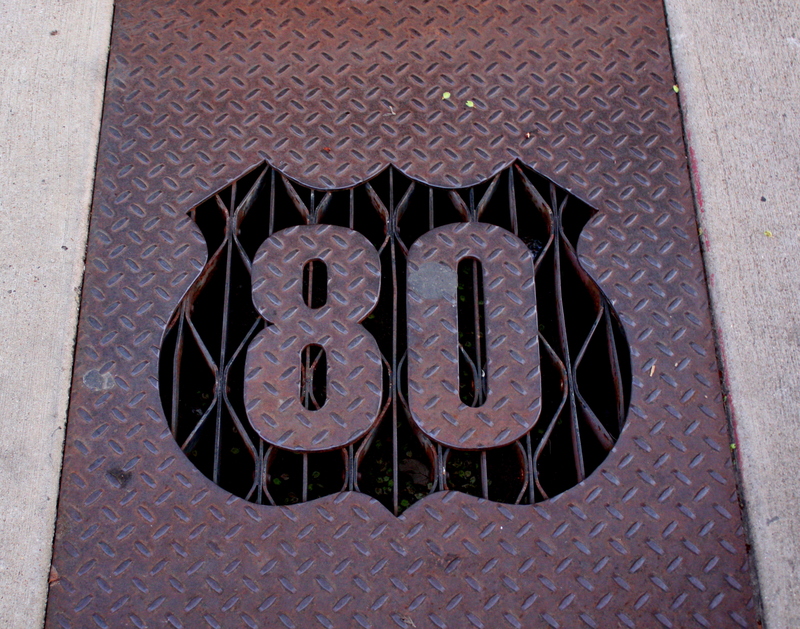 US 80 sidewalk grate, Davis St.
Bishop Arts dates from a time when Oak Cliff was a stop on the Interurban electric train connecting Dallas and Fort Worth, and locals still remembered when the Houston Street Viaduct first permanently connected them to Dallas… and when Dallas annexed them. 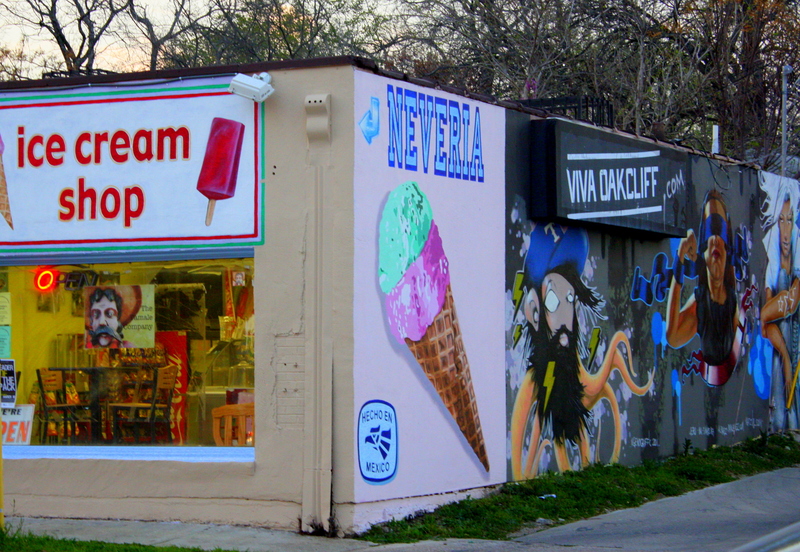 The patronage of Winnetka Heights and Kessler Park residents may be fueling the Bishop Arts revival, but the District is actually the hole in the West Dallas donut of a vibrant Latino neighborhood. I rarely pass through it without coming upon a sight that makes me smile or pause to reflect. 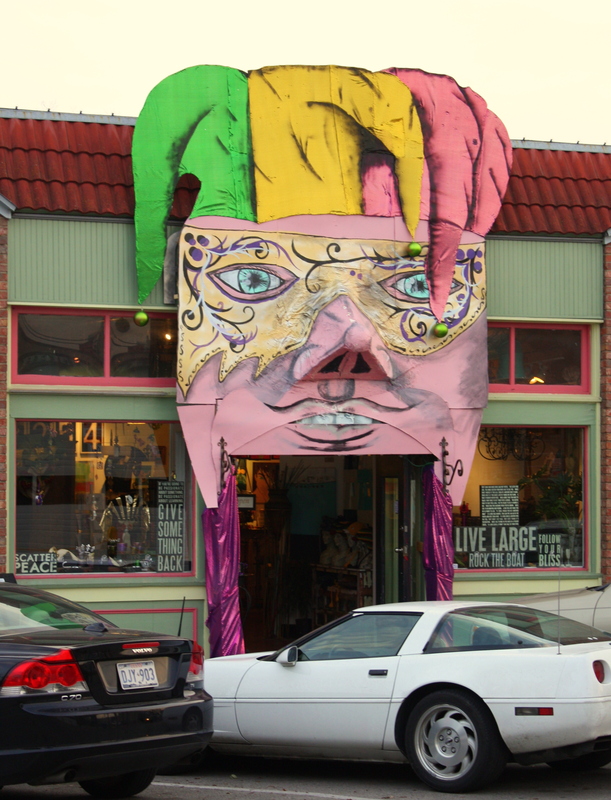 This is a neighborhood in transition, and all along the edges of Bishop Arts contrasting images of its patchwork identity often appear side by side. This kitschy sidewalk grate made good on its promise for more of the same inside. 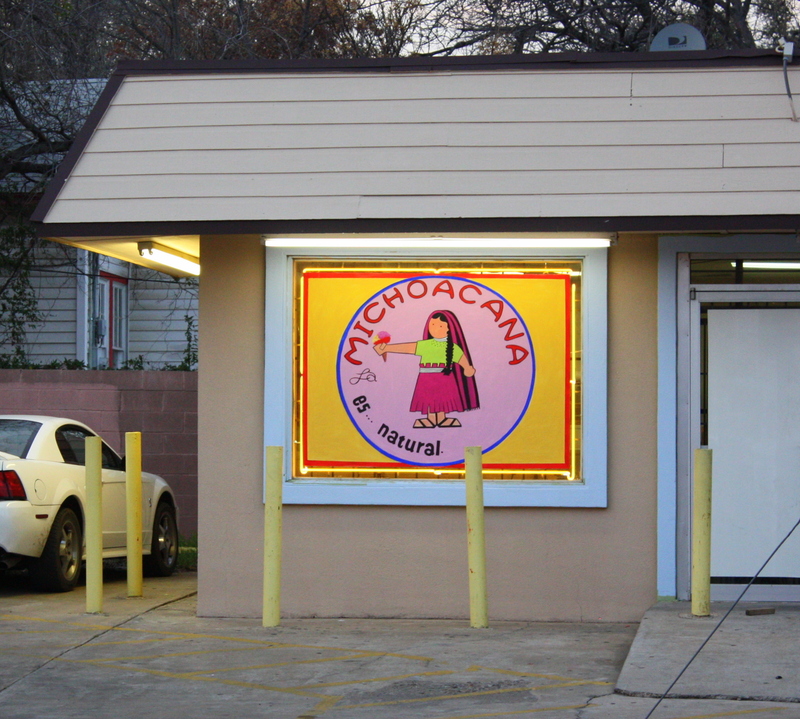 There’s a rich tradition of ice cream-making in the Mexican state of Michoacan, and it’s alive and well here at the edge of Bishop Arts. 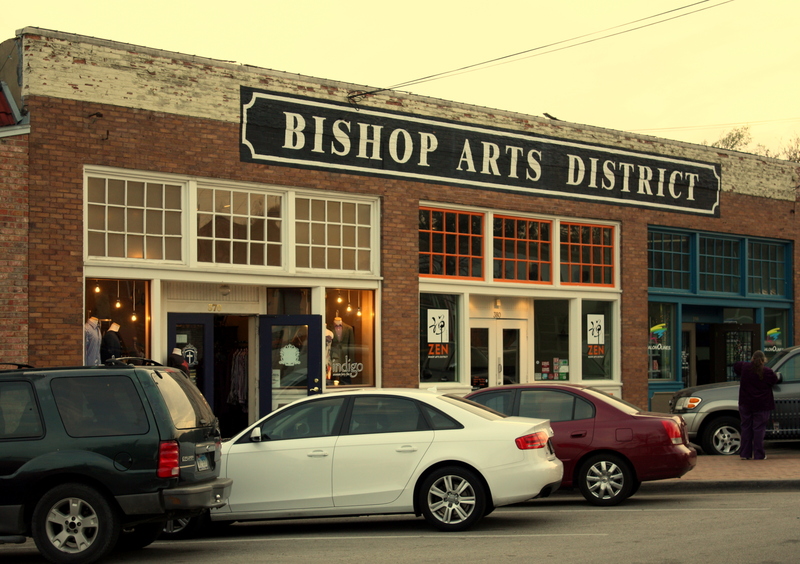 Local businesses have banded together to create Bishop Arts First Thursdays, an evening showcase experience. 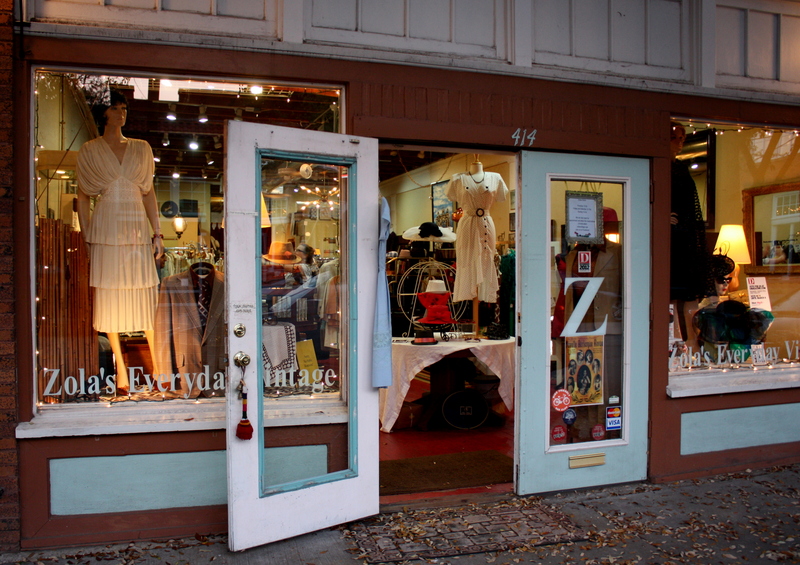 On First Thursdays boutiques and galleries join neighboring restaurants and bars in keeping lights on and doors open well into the evening. I arrive just before dusk as the streets slowly come alive. There are almost no darkened storefronts, and the retail shops and galleries draw well beyond the young singles bar crowd. 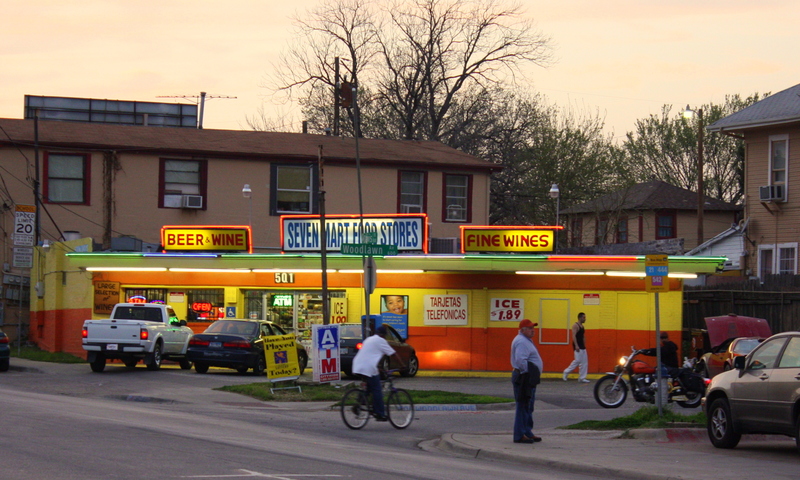 Several continuous blocks of sidewalk invite the stroller to drop in and make of the evening meal a moveable feast. 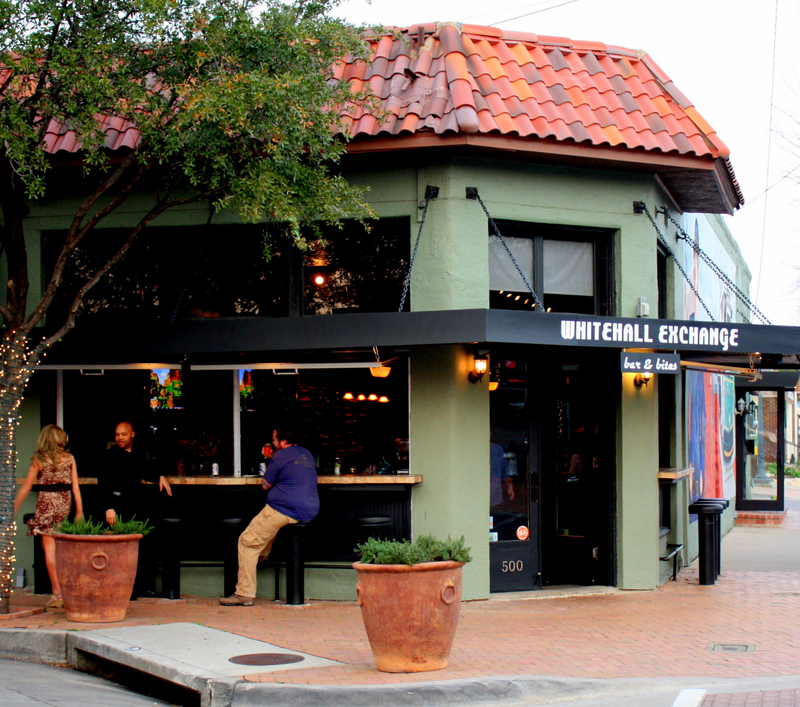 With the weather warming, many restaurants have flung open doors and windows, and you can have a drink seated at a sidewalk stool comfortably close to the bar. I’m reminded just for a moment of Bourbon Street. 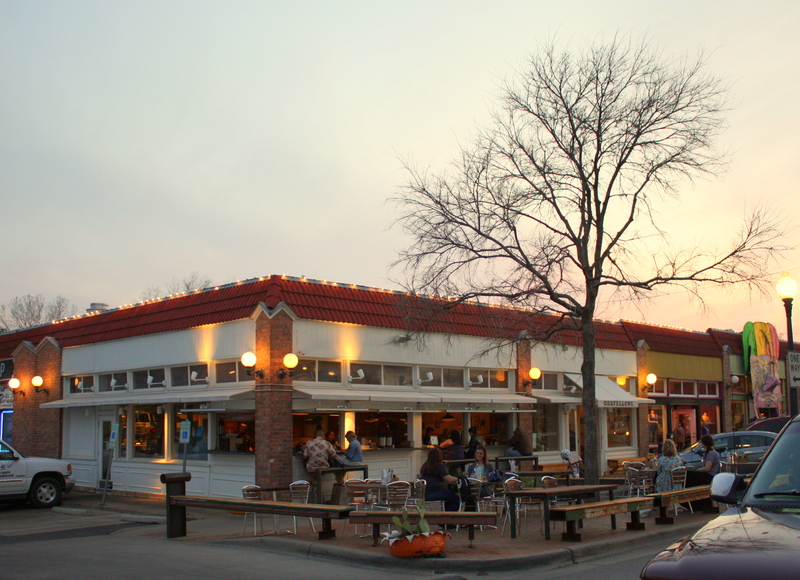 There’s plenty of patio dining to be found. 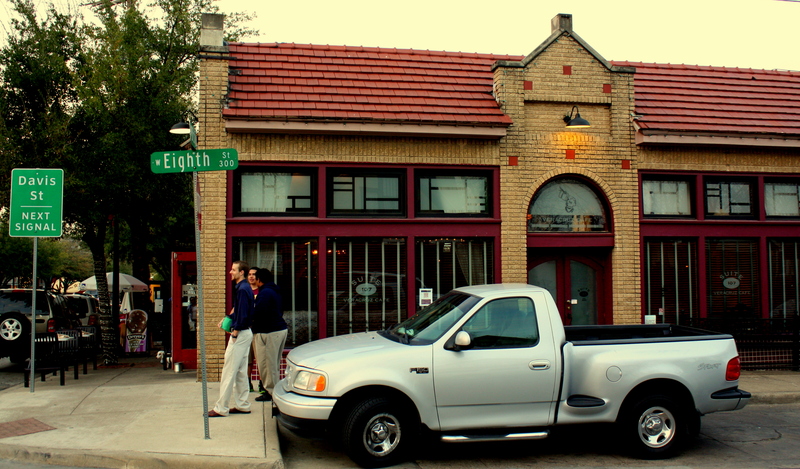 Within 2 blocks of Bishop and Davis there’s BBQ and Thai and just about everything in between. 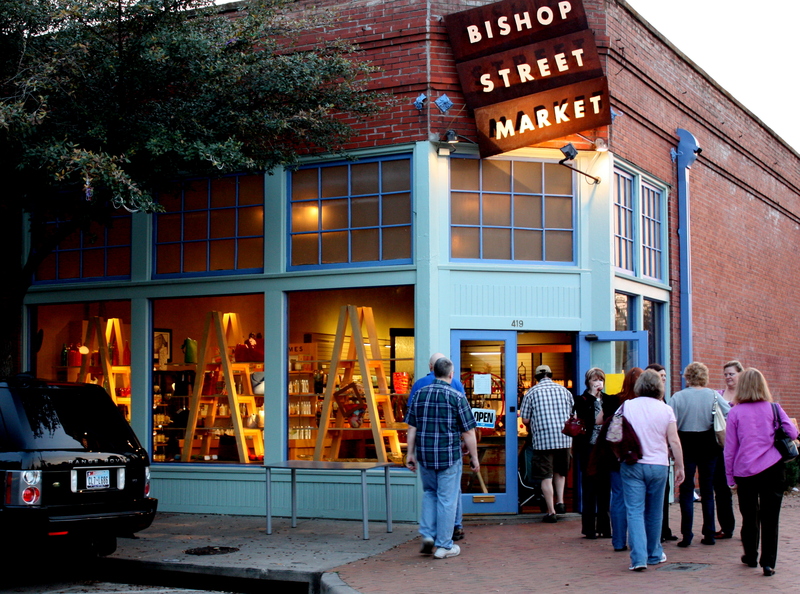 Nothing in Bishop Arts seems run-of-the-mill, and it’s clearly attracted like-minded merchants and restaurateurs. 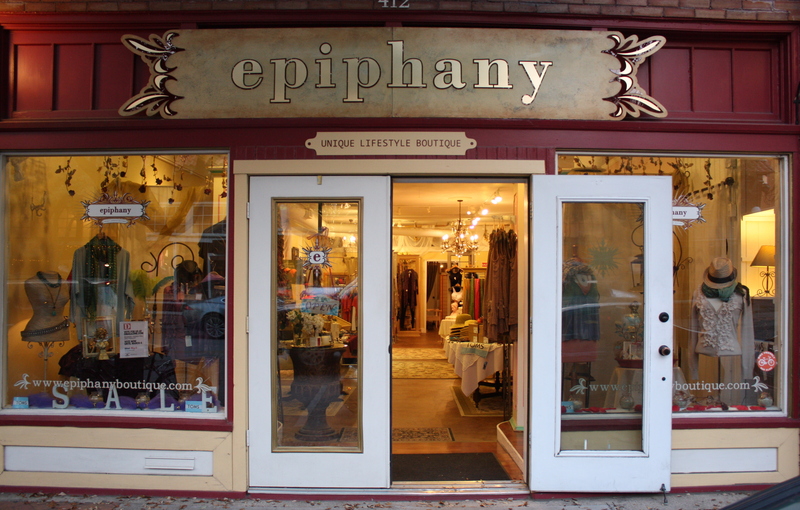 You won’t find Gap or Anthropologie or anything that smacks of a national chain here, and it’s refreshing to spend an evening outside the cookie cutter! 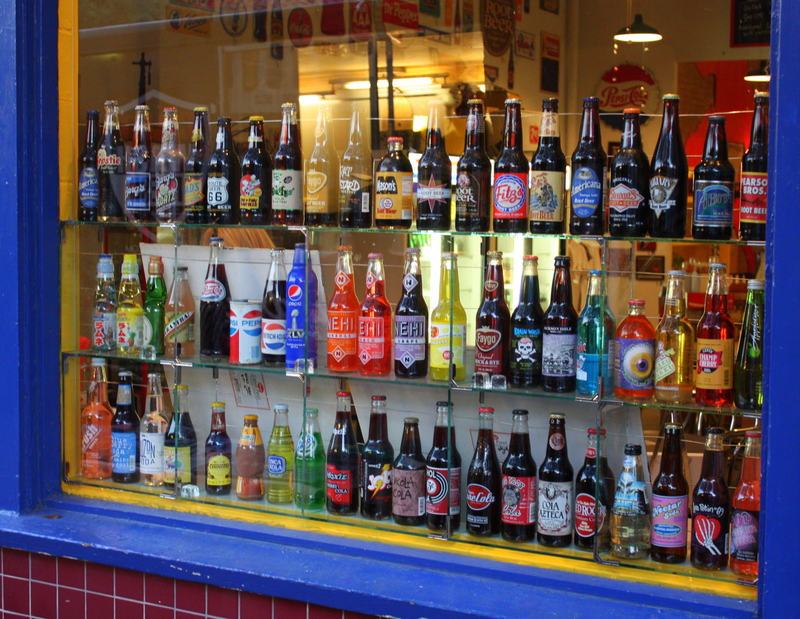 The Soda Gallery has to have the world’s largest selection of soft drinks, made up mostly of old and regional brands like Nehi, Faygo, and Frostie that I haven’t seen since childhood. Somehow, and aluminum can just doesn’t have the same cachet. How about a nice red pop? 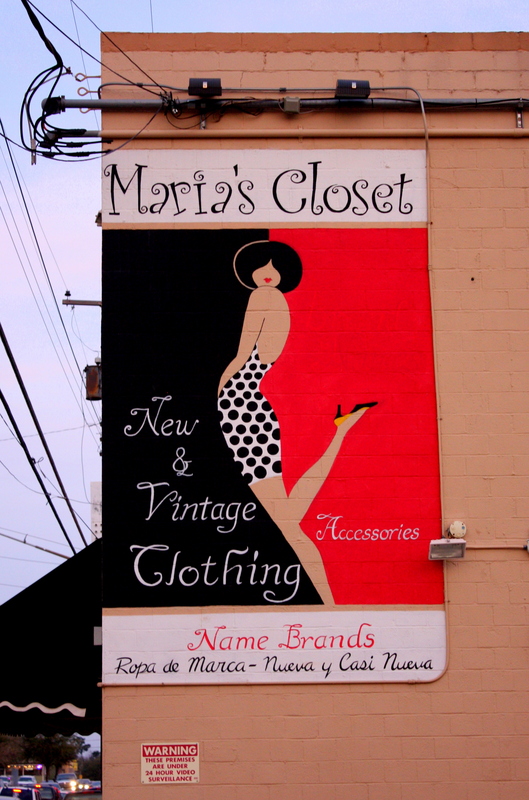 Some of the shops have great signs, but I’ll admit that I wasn’t enticed into Maria’s Closet by its sign. 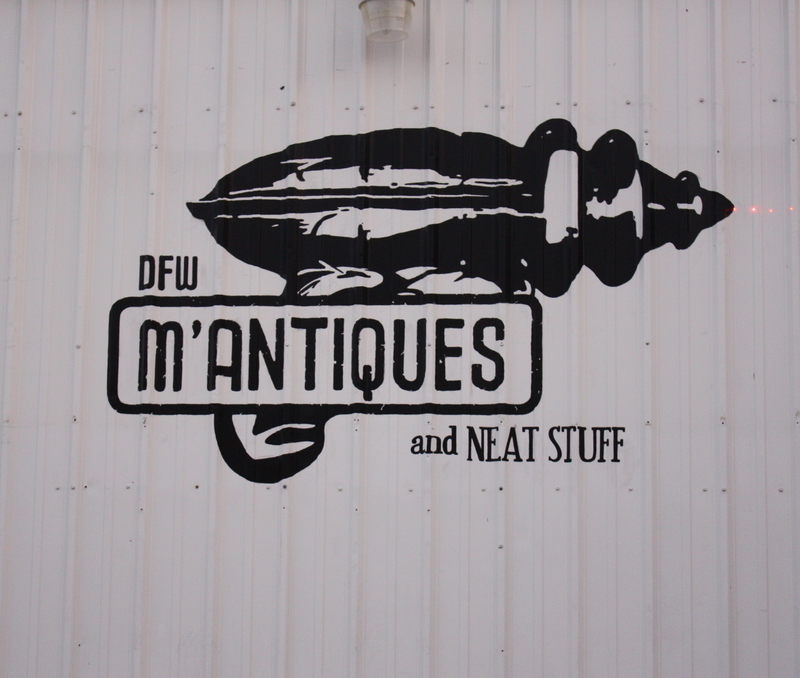 I’ll also admit that I had to go in and ask the folks at M’Antiques if it was Captain Kirk’s phaser or Flash Gordon’s ray gun woven into their logo. 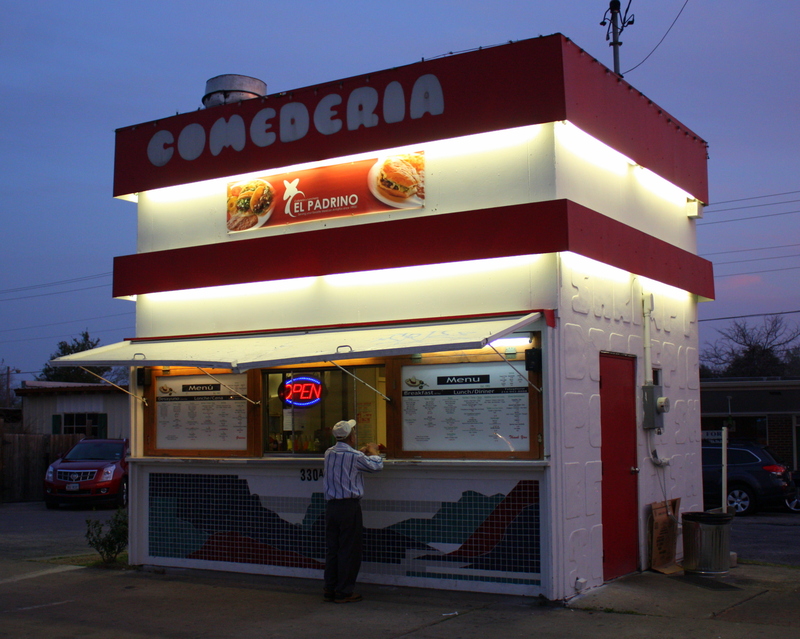 Veracruz Café is one of the standout Mexican restaurants in a town which has no lack of them. The regional menu draws from the cuisine of Mexico’s Caribbean coast, and here you’ll find new dishes and flavors that will make you completely rethink Mexican food. 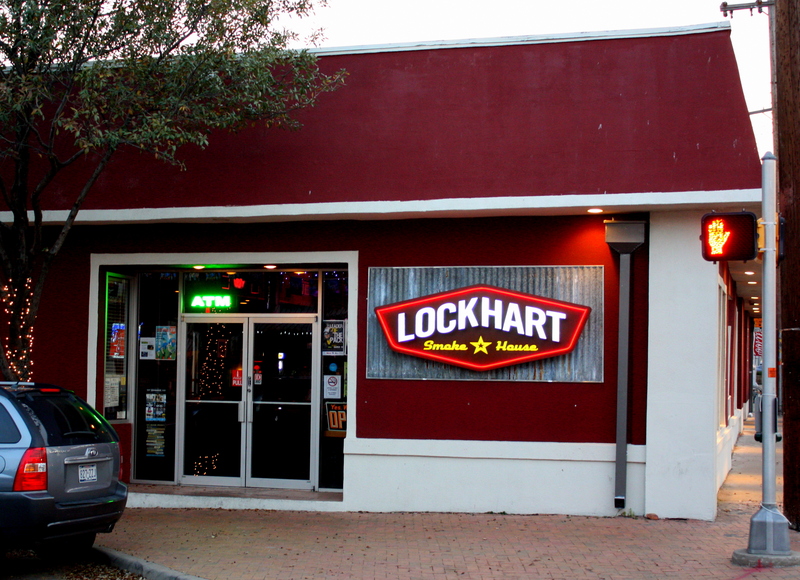 They’ve twice expanded into adjacent space and gotten a liquor license since I first came a few years ago. I often top off a meal here with a latté at Espumoso Café just a couple of doors down. 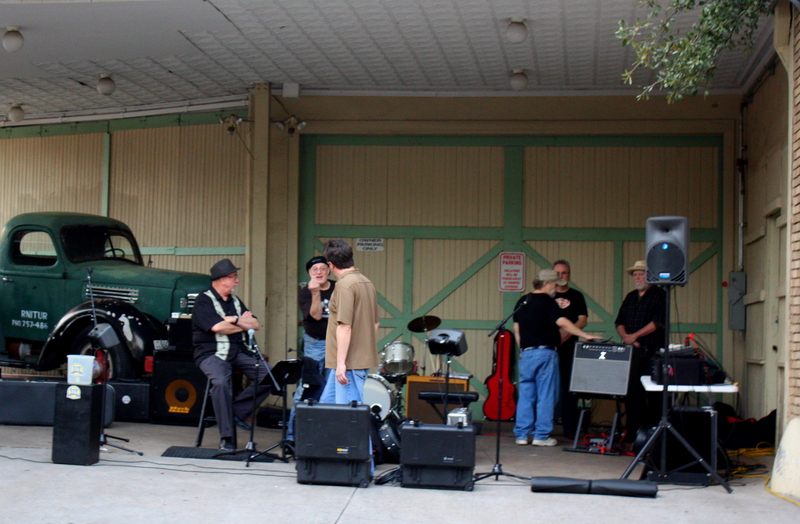 Under the canopy of what looks to have once been a service station a band is setting up, chit-chatting with passers-by and seemingly in no hurry to begin. It’s a lack of concern for the exact time that seems to hang over the District; everyone’s already where they’re going. 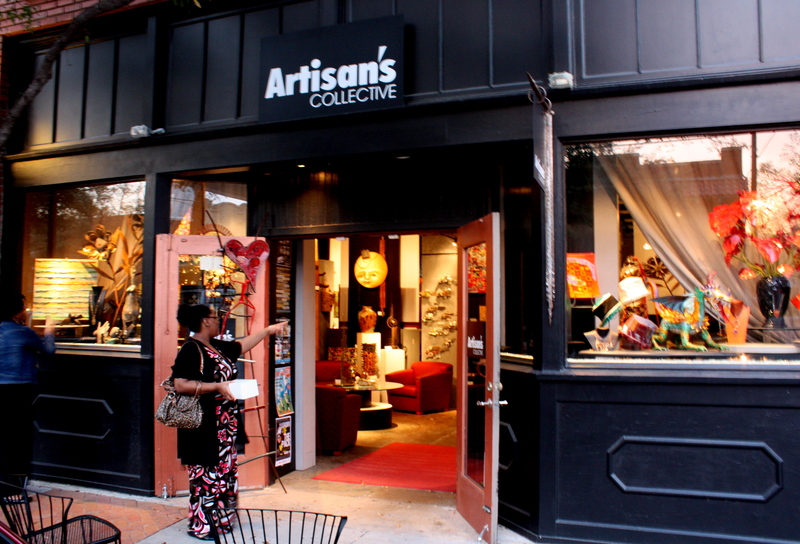 I first wandered into the Artisan’s Collective over a year ago. The sheer number of pieces on display is awesome, and with over 100 Dallas artists on exhibition it’s an unmatched smorgasbord of media and styles. This is one of those places that invites you to a quick walk-through and keeps you browsing for a worthwhile hour. “Pizza Tavern” doesn’t seem to adequately sum up the Eno’s experience. 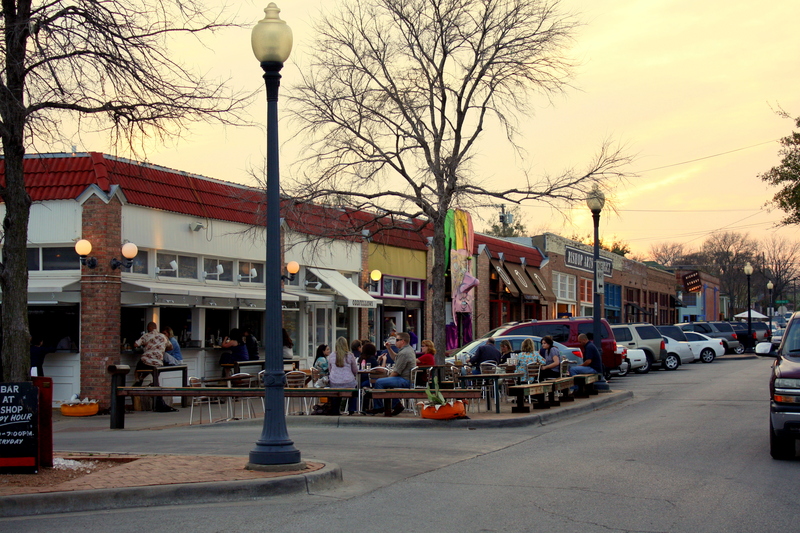 On this evening strollers take turns sitting in big Adirondack chairs that Eno’s has placed on the sidewalk. 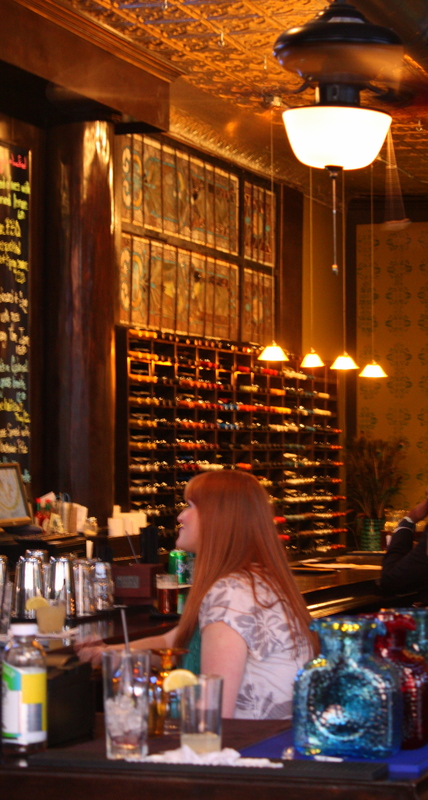 As much fun as this place can be on First Thursdays, it’s also a great place for Tuesday live jazz and Sunday brunch. 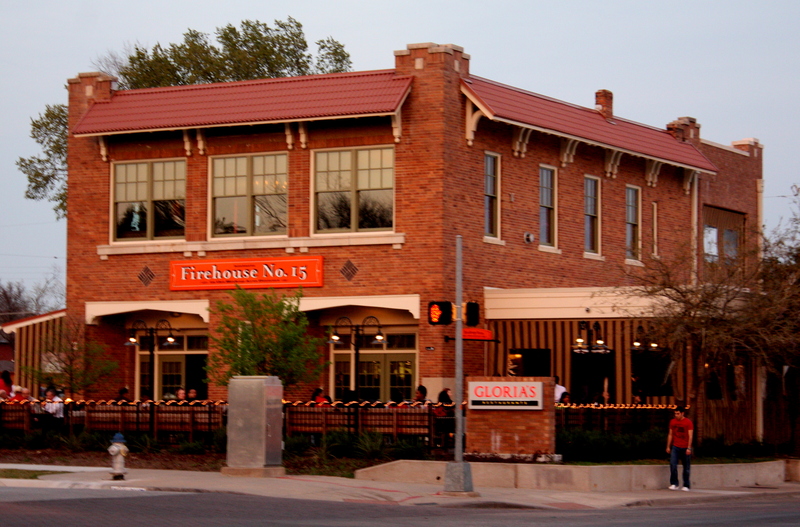 The building is a classic and the renovation inspired! Dusk is now long gone, and as I head back to my car the Il Padrino Comederia glows like some alien spaceship hovering over the District. All along Davis neon blazes and people are out in the streets. I cross the Trinity on the old Jefferson Street Viaduct. Off to the far left the lighted arch and steel strands of the Calatrava bridge glow in the darkness. Waves of colored light wash across the face of the new convention center hotel. And far above it all the pinpoint lights of the Reunion Tower globe sparkle. 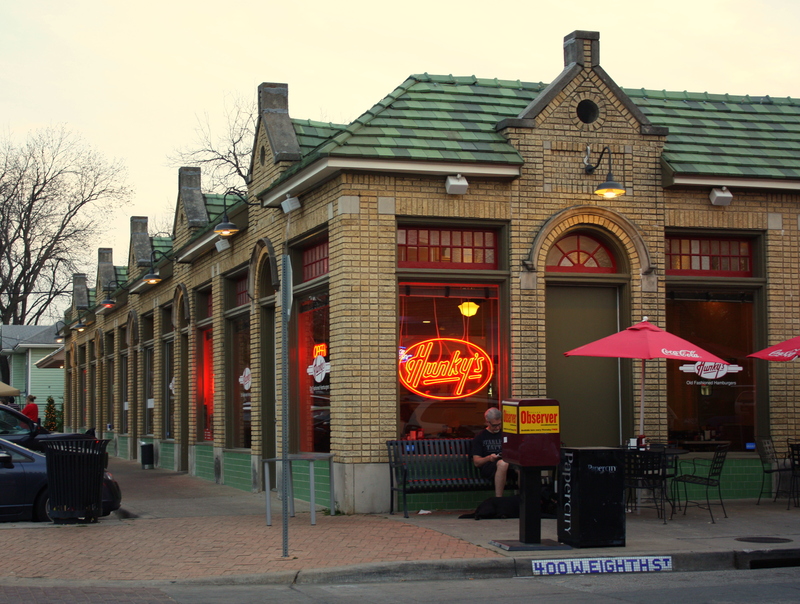 (See also my related posts “Dallas’s Erasable Past,” and “Bicycle Perspective”).